Before beginning any chair we will have a discussion about where the chair will reside, how you will use it and the features you would like. We will also talk about the flooring and other furnishings that the chair will have to work with and I will need to get some measurements from you if you are not available for a "seating". I've gotten very good at this over the years and developed a reliable system for sizing each chair I make. Once I have determined the type and color of wood or woods that I need for a rocking chair I set out to find just the right matched boards. It is essential that boards be matched for grain and color to achieve the product I make and that the wood is correctly dried for the place it is going to live. If you live in CO or AZ, for instance, I will have your wood dried to about 4%mc before building it. For almost all other areas I have found that 7%mc works best. Sometimes I have the wood you would like in stock, at others I have wood dealers send me digital photos of the exact stock I am looking for and I will share this with you. Sometimes I must travel out of state and closer to timber country to find your exact wood. Having found the right wood for your rocking chair I begin the process of laying out how the various boards will work together to achieve the most dramatic effects possible. Many of the components are mirrors of their opposite (one rear leg to another or a seat from side to side). 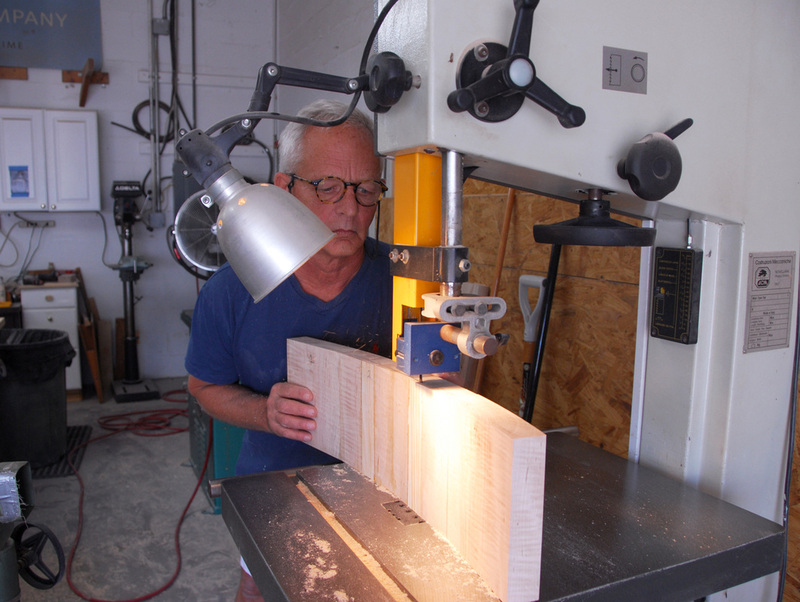 The components are then rough-sawn on the band saw and I begin the laminate process that I use to create the matching rockers and back braces. During this process I will saw a particularly attractive board into dozens of slender laminates that I then glue back together in forms to create the back braces and rockers. This enables me to obtain a perfect match on these components. The seat is then glued up, sometimes two boards, sometimes 4, sometimes 6 or 7 pieces if accent woods are employed. 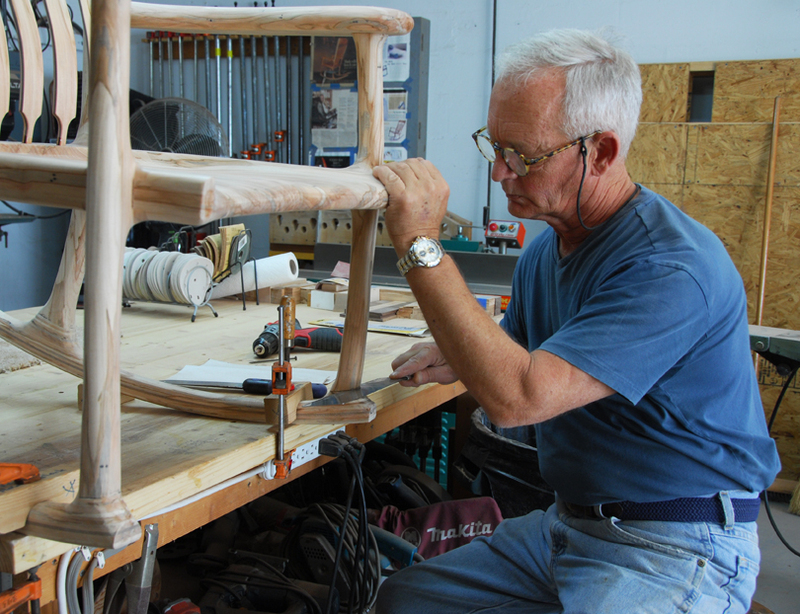 Then the real work of shaping the legs, sculpting the seat, coopering the head rest pieces and cutting the marvelous rounded, mortise and tenon joints that make these chairs so distinctive, begins. The rocking chair gradually takes shape and expresses its own individual personality. At this point I name each chair. Sometimes a grain pattern will demand lots of flats and chamfers. Another might insist on nothing but rounds. In the end each rocking chair is distinctively unique although based on the same original design. After almost two weeks of work I begin the finishing process and conclude the preparation of each chair sanding each to 1000 grit. During this phase I bring each rocking chair to a level of smoothness seldom seen or felt in our fast paced production world. The final steps entail several coats of hand rubbed Danish oil. 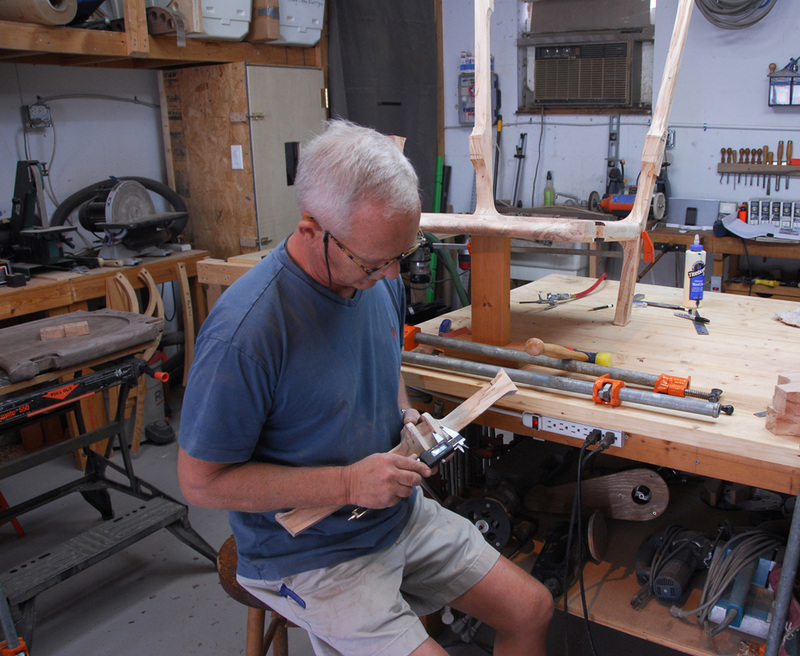 Using a flush-cut saw to make the joint where the front leg of the chair transitions into the rocker. Cutting a smooth curve into the "coopered" headrest. 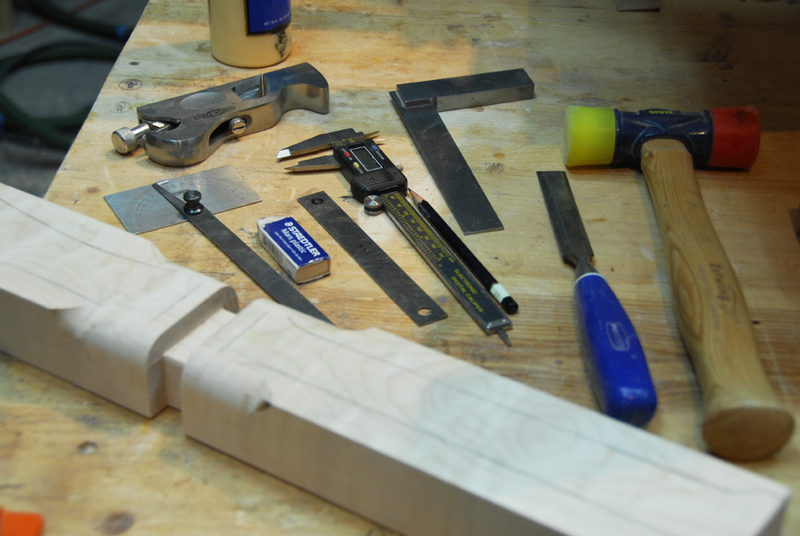 Some of the tools I use when making a rounded mortise and tenon joint. Using calipers to measure a mortise.